Nāgārjuna (నాగార్జునా in Telugu, 龍樹 in Chinese) (c. 150 — 250 CE) was an Indian philosopher, the founder of the Madhyamaka (Middle Path) school of Mahāyāna Buddhism, and arguably the most influential Indian Buddhist thinker after the Gautama Buddha himself. There are other works attributed to Nāgārjuna, some of which may be genuine and some not. In particular, several important works of esoteric Buddhism (most notably the Pañcakrama or «Five Stages») are attributed to Nāgārjuna and his disciples. Contemporary research suggests that these works are datable to a significantly later period in Buddhist history (late eighth or early ninth century), but the tradition of which they are a part maintains that they are the work of the Madhyamaka Nāgārjuna and his school. Traditional historians (for example, the 17th century Tibetan Tāranātha), aware of the chronological difficulties involved, account for the anachronism via a variety of theories, such as the propagation of later writings via mystical revelation. A useful summary of this tradition, its literature, and historiography may be found in Wedemeyer 2006. 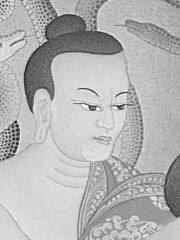 For more on Nāgārjuna’s philosophy, see Mūlamadhyamakakārikā. Shunyatasaptati, Vaidalyaprakarana, Vyavaharasiddhi (fragment),Yuktisastika, Catuhstava and Bodhicittavivarana. A translation onlyof the Bodhisambharaka. The Sanskrit and Tibetan texts are givenfor the Vigrahavyavartani. In addition a table of source sutras is given for the Sutrasamuccaya. Campbell, W. L. Ed. and trans. 1919. The Tree of Wisdom: Being the Tibetan text with English translation of Nāgārjuna’s gnomic verse treatise called the Prajñādanda. Calcutta University. Reprint: Sonam T. Kazi, Gangtok. 1975. McCagney, Nancy, 1941. Nāgārjuna and the philosophy of openness. Lanham, Md. : Rowman & Littlefield, c 1997. Murty, K. Satchidananda. 1971. Nagarjuna. National Book Trust, New Delhi. 2nd edition: 1978. Samdhong Rinpoche, ed. 1977. Madhyamika Dialectic and the Philosophy of Nagarjuna. Central Institute of Higher Tibetan Studies, Sarnath, India. Sastri, H. Chatterjee, ed. 1977. The Philosophy of Nāgārjuna as contained in the Ratnāvalī. Part I . Saraswat Library, Calcutta. Walser, Joseph. Nāgārjuna in Context: Mahāyāna Buddhism and Early Indian Culture. New York: Columbia University Press, 2005. Wedemeyer, Christian K. 2006. Āryadeva’s Lamp that Integrates the Practices: The Gradual Path of Vajrayāna Buddhism according to the Esoteric Community Noble Tradition. New York: Columbia University Press.